Africa is the origin of man, four and a half million years ago. All human beings only lived in Africa until about 100,000 years ago. The European Stock (Europeans, Americans, Canadians, Australians), the Asians, the Arabs etc., are all former Africans. They lost the black pigmentation in the skin in their skins on account of their living in the cold climates, with little sunshine, where melanin is not required. Africa is also the pioneer of civilization. The Egyptian civilization which started around 5200 years ago, around 3000 BC, is one of the earliest civilizations of the human race. The three great religions of the modern world were succored by Africa in one way or another. These are Christianity, Judaism and Islam. Baby Jesus was hidden in Egypt when King Herod started killing all the infants. This is found in the Book of Matthew 2:13-14 in the Bible. Yet, this Africa of many firsts in the history of the human race, has faced calamity after calamity in the last 500 years. These calamities have included: the slave trade, colonialism, genocide in some cases, neo-colonialism and marginalization. Why has this been so? What is amazing is that many of the African political elite, the intellectuals, the other social leaders etc., have not bothered to investigate the cause of our near extinction in the last 500 years. And to look for ways of how we can immunize ourselves against any and all threats against our survival, our sovereignty, our security and our prosperity in our land. That is how we come to the two issues that we regard as crucial for our future. These are: political and economic integration of Africa. Our view is that African integration means three things: prosperity, security and fraternity. We cannot guarantee our prosperity if we do not solve the issue of market. When companies or families produce products (goods) or services, how many consumers will buy those products? If a product does not have enough buyers, the business will fail. In Uganda, recently we had a big crop of maize. We produced 5 million tonnes; but Uganda consumes only 1 million tonnes. The prices collapsed. Many farmers will move away from maize in the coming seasons. This is just one example. Many others can be quoted across Africa. We, therefore, need economic integration to provide market for our producing families and companies to be assured of a market on principles of competitiveness. The integrated African market will not only stimulate production in Africa, it will also enable us to negotiate credibly with the other big markets such as the USA, China, India, Russia, European Union, etc. It is good that, recently, we agreed on the Continental Free Trade Area (CFTA). Let us implement its provisions. It is the way to prosperity and part of the answer for under-development, poverty and joblessness. However, economic integration, even if it creates prosperity for our individual countries, will not answer the issue of strategic security against global threats. The Americans are talking of four dimensional superiority: superiority on land, in the air, at sea and in space. Recently, President Donald Trump was talking about creating a Space Army. Many African countries do not yet have even a capable Army on land, let alone air, navy or space. What is the future? Even when our individual countries become first World or Middle Income countries, they cannot, individually, have the strategic capacity to defend themselves against the global super-powers. Israel, technologically, is a super-power. However, strategically, Israel would be hard-pressed to survive in the Middle East without the partnership of the United States. Therefore, in the end, size also matters. That is why, therefore, we say that, in addition to economic integration, where feasible, political integration is very crucial. The present 54 States of Africa, even when they are developed, may not be able to guarantee our future against greedy global powers. The attack by the Western countries against Libya was a shame to Africa. That is why, therefore, for the 55 years, I have been in the footsteps of Mwalimu Julius Nyerere on the issue of the East African Federation (the political integration of Kenya, Tanzania and Uganda). 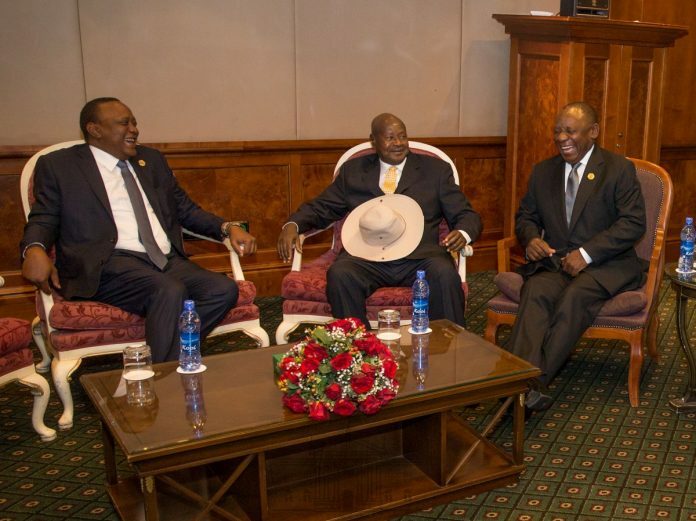 The EAC has since expanded to include: Rwanda, Burundi and South Sudan. These people are specific groupings of the African peoples comprised of the Interlacustrine Bantus and the Interlacustrine Nilotics, Interlacustrine Nilo-Hamitic and Interlacustrine Cushitic. These groups have great similarities in dialects and also linkages among different clusters. Above all, they have the good fortune of having the de-tribalized dialect of Swahili. The six countries are working upon the issue of Confederation and, ultimately, Federation. The politically united States of East Africa, with the present population of 170 million, which will be 878 million by 2050, with I million square miles of land territory, would be equal to India in land area. Such a unit would be cohesive, around Swahili, as well as a centre of gravity for African security. It would be capable of any tasks ─ to defend Africa, if necessary, on land, at sea or in space since that is what others want. We should, then, look across Africa. Which other areas have such similarities and linkages? How about Southern Africa? How about Central Africa? How about West Africa with its cross-border peoples of the Hausa, Fulani, Yoruba, Akan, Mandigos, etc.? How about North Africa with its people that are Arabic speaking and, mainly, Moslems? How about the Horn of Africa with its confluence of the Cushitic and the Semitic peoples of this area? I would not die from blood pressure if the present 54 States of Africa, the former colonies, were replaced by 10 or States, each about the size of India. When the British forced the independent tribes of our area into a Uganda, they, definitely, did a good thing. If Uganda is a better product than the “Republic” of Ankole, my tribal area, why shouldn’t the Union of East Africa be better? Therefore, integration of Africa means 3 issues: prosperity; strategic security; and fraternity. When the Europeans were ready, after the Berlin Congress, they penetrated the continent and picked up many chiefs like grasshoppers. Europe, America and Asia are now going towards the 4th Industrial Revolution ─ the use of intelligent machines. In Africa, we have not even gone through the first and second Industrial Revolutions ─ the use of steam engines and electricity. Yet, the economic and political integrations are crucial stimuli for these changes. The African leaders, therefore, need to work hard so as not to share the fate of the pre-colonial tribal chiefs that let down their peoples. When I listen to the swearing speech 33years ago and his AU presentation, differentiate between rhetoric and action.